Ted Miller, Ford’s head of energy storage strategy and research, says the cobalt supply situation might get “tricky” over the next few years. The unprecedented increase in electric car demand forecasts and the issues surrounding security of supply of raw materials continue to be hot topics at this year’s Mining Indaba conference, in Cape Town, South Africa. At the event, which is celebrating its 25th anniversary, Ted Miller, head of energy storage strategy and research at Ford (NYSE:F), spoke at a panel about electric vehicles (EVs), the future of cobalt supply and its use in lithium-ion batteries. Miller said that even though current cobalt supply should keep pace with demand, the situation might get “tricky” over the next three to five years. Ford has previously announced it is ready to launch new electric cars as soon as next year, with plans to invest US$11 billion in EVs by 2022 — and EVs need batteries. Currently, there are 68 lithium-ion battery megafactories in the pipeline, with a total capacity of 1.45 TWh by 2028, according to Benchmark Mineral Intelligence. To meet this increasing demand, cobalt supply will need to reach over 200,000 tonnes by 2028. However, one of the main cobalt supply-side issues is that more than 50 percent of the metal is mined in the Democratic Republic of Congo, where mining has often been linked to child labor and human rights abuses. In fact, carmakers have been trying to reduce their dependence on cobalt, but Miller warned that the drive away from cobalt was playing into the hands of other metals. “We’re switching out cobalt dependency for nickel,” he said. Aside from EV maker Tesla (NASDAQ:TSLA), which uses nickel-cobalt-aluminum cathodes with lower cobalt content, most automakers use nickel-cobalt-manganese (NCM) cathodes for their EV batteries with a 5:2:3 and 6:2:2 compositions currently being the most common. Discussions around a change in composition to 8 parts nickel, 1 part cobalt and 1 part manganese have been going on for several months, but despite the stability nickel could bring to the supply chain compared to cobalt, many analysts still believe the switch to higher-nickel cathodes will not happen as fast as many expect. “The shift to higher-nickel NCM is coming, but it won’t happen overnight,” Roskill’s Director Jack Bedder told the Investing News Network. 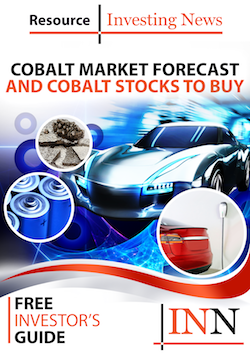 Similarly, Benchmark Mineral Intelligence Managing Director Simon Moores said in a report that even though electric vehicle manufacturers don’t like the supply chain risks cobalt has, they do, however, like the safety properties cobalt brings to an EV battery. “This love-hate relationship is at the core of the EV revolution,” he added.